Building Materials/Description: $14,000. 2-story courthouse made of handmade Mexican brick built by mason Juan Rios. Original 2nd story and cupola destroyed by 1910 fire; windows, doors and roof modified. 1982 work restored first floor only. National Register Narrative The Old Hidalgo Courthouse Complex encompasses three converging corners at Flora and 1st Street in the small border town of Hidalgo. The original Public Square is bounded on the west by Bridge Street, originally one of the main north-south routes between the U.S. and Mexico via a ferry (now accessible by a bridge at the same location) The courthouse and jail were built in this location in 1886 after flooding from the Rio Grande destroyed the originals. The courthouse originally was a two-story symmetrical- plan structure of handmade brick from Reynosa, Tamaulipas, Mexico. The mason was Juan Rios, of Tamaulipas. The square plan consisted of a central north-south hall with a pair of paneled doors at each end, tall narrow windows symmetrically spaced for ventilation and was capped with a wooden cupola. The cupola, roof, and second story were destroyed by fire in 1910, and were replaced by a hipped roof over the ground floor. Windows have since been modified and the original first floor exterior walls are intact. The building is now used as a rental residence, although plumbing has never been added to the structure. Adjacent to the courthouse, joined by the remnants of the connecting brick courtyard and walls, the jail is a simple two-story block of the same handmade brick, by the same mason from Mexico. There are trabeated openings, and a slight projection in the brick coursing forms a cornice, with two chimneys enhancing the silhouette. The jail is used for storage now. The original brick pavers and ruins of the brick walls connecting the two buildings, with the original hand-dug brick well in the center, are still in evidence. A small wood-frame outhouse stands near the northeast (rear) corner of the courthouse. East of the courthouse and jail, across 1st Street, is the one-story brick merchandise store which also housed the Post Office from the date it was built in 1839 until 1913. The rectangular building is capped by a projecting entablature on the west and south facades (facing 1st and Flora Streets) complete with brick dentils and corbeled cornice. 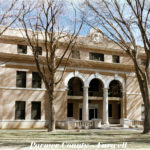 The detailing and proportions of the building are similar to the elegance and sophistication found in the Portscheller designed buildings of the early historic district of Roma, Texas (N.R. 1972). The roof, supported by vargas and latias, is of tipichil, a local term for a type of caliche concrete. The building is now being used as a residence. South of the Post Office, across Flora Street, is the Rodriguez Store (ca. 1890), a two-story brick building with pilasters terminating at the cornice in a small corbelled parapet. The pilasters rest on a cyma-reversa base. The lower floor doors are trabeated and the second floor windows are segmentally arched. This building is now unoccupied. A 1922 vintage gasoline pump remains on the northwest corner. Both the Post Office and Rodriguez Store are set very close to the street in the Mexican fashion. The Old Hidalgo Courthouse Complex is the only remaining cluster of historic buildings in the town and represents the late 19th century communities that developed along the northern bank of the fertile Rio Grande River Valley founded on previous 18th century settlements from the Spanish Nuevo Santander colony, where early settlements denoted ranch out-posts possibly as early as 1779. The historic structures in this complex share mainly a vernacular expression derived from their common Spanish heritage, as well as a temporal relationship. 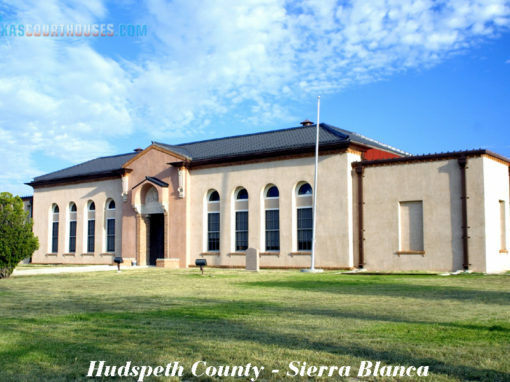 During the period the county seat was located in Old Hidalgo, Anglo- American settlement increased, the first railroad was brought to the area (1904), the first citrus fruit and vegetables were produced on a commercial basis, and the first newspaper was printed. Hidalgo County was organized in 1852, following the war with Mexico, and named in honor of Father Miguel Hidalgo, leader of the Mexican independence movement in 1810. 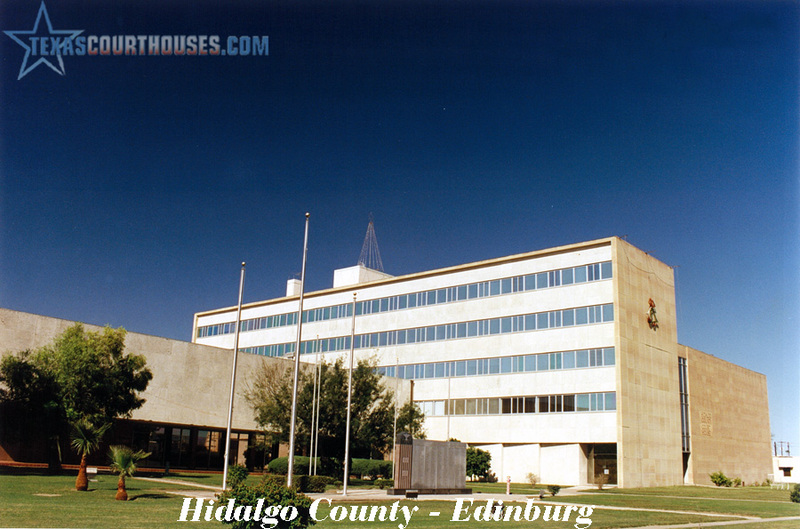 The county seat, named Edinburgh, was established with the public buildings on the bank of the Rio Grande River. The relocation of the community further from the river around the new courthouse in 1886 preceded the almost complete destruction of the early site by an overflow of the river in 1887. In 1908, Edinburgh as county seat was again relocated north some 14 miles and the old town site was renamed Hidalgo. While interest in saving the courthouse complex buildings is high, the community lacks the funds for major preservation or restoration efforts.